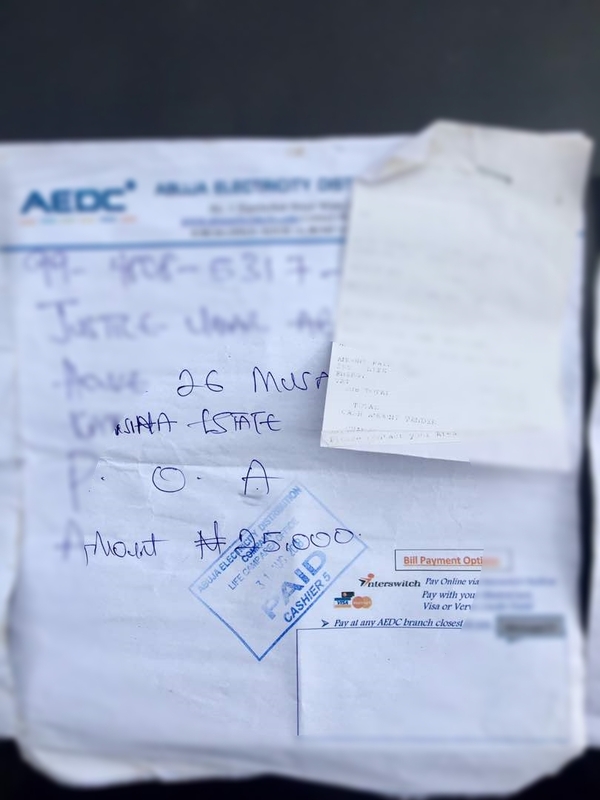 ABUJA ELECTRICAL DISTRIBUTION COMPANY,(AEDC)- Abuse of Fundamental Human Rights, Abuse of power, Impunity and Corruption - Audio discussions between AEDC, Abuja and their customer. Several customers in "KATSINA ESTATE, KAFE DISTRICT, ABUJA, FCT", have been facing a typical immoral and illegal conduct by the "ABUJA ELECTRICAL DISTRIBUTION COMPANY, (AEDC)" which has become rampant in all parts of the company with immeasurable court cases against the establishment since the privatization of the power holding companies from the Federal government to influential private individuals that hold a high stake in the company. The customer have applied for prepaid meters for over 12 months dating back to 2017. The flat rate of the homeowner is 27 thousand Naira monthly but the figure increases every month ranging from 54 thousand, 64 thousands to over 80 thousand. The customer has paid 25 thousand Naira 3 times in less than one month and his electricity has been disconnected twice despite payment of his bill which the AEDC staff in Life-camp where their branch is located have been extorting, inflating, harassing and fraudulently been conniving with some people from behind the scene to carryout their illegal act despite the Federal Government of Nigeria has declared a "NO METER, NO BILL POLICY" for consumers that fall in that category. 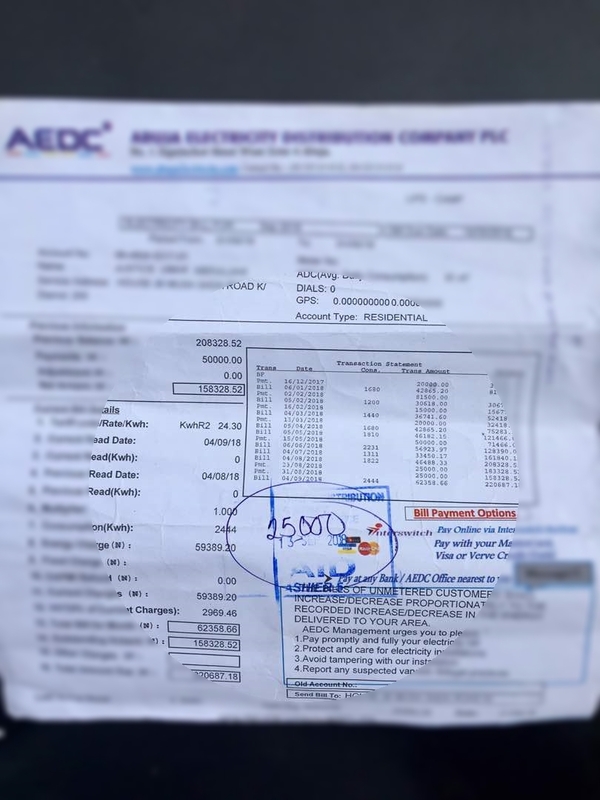 The power holding company, (AEDC) disconnected the electricity of a Member, House of Representatives after clearing his bill but was issued another bill of over a hundred thousand Naira the next month. "MRS UCHE, MR TONY, (JUNIOR STAFFS OF AEDC IN LIFE CAMP) AND MR DAVID CHRISTOPER, (HEAD OF ELECTRICAL STATION IN KATSINA ESTATE FACILITY MANAGEMENT)", being the ones behind the fraudulent behavior. In view of the above written statement, it leaves the aggrieved customers no choice but to go public with regard to the matter for the purpose of seeking justice and to make sure such acts are hindered for the welfare of customers that are being oppressed by AEDC and future purposes. This is a clarion call and a plea to all the relevant authorities like the "CONSUMER PROTECTION AGENCY" among other related organizations with such responsibilities of investigating such disputes to intervene their official capacity in order to put an end to such impunity and corrupt and injustice against the aggrieved parties. #RISEAGAINSTOPPRESSION!